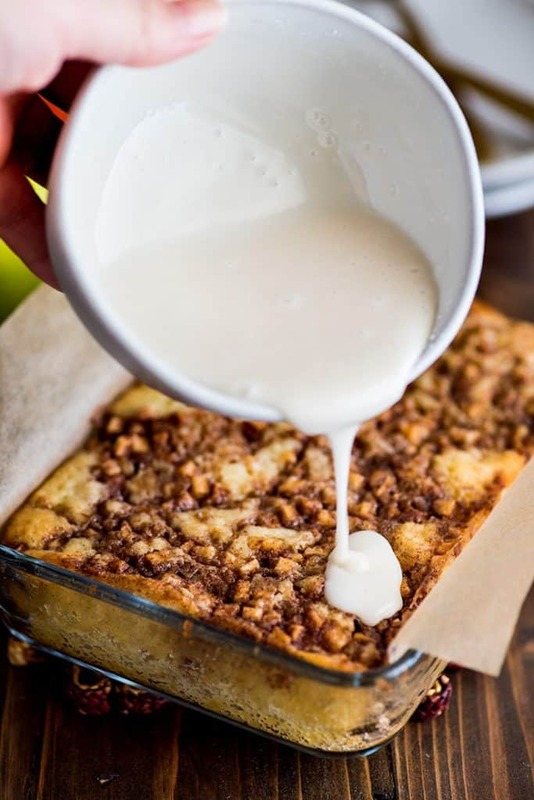 A few months ago, ages before apple weather, when we were all still in shorts and sandals, eating ice cream (who am I kidding we’re still doing that here in California), I scrolled past this apple cake on Pinterest. And I had to have it. Like instant, want to reach through the screen, had to have it. BUT that recipe makes a 9×13-inch cake, and I knew that if I made a 9×13-inch cake, I would eat a 9×13-inch cake (or a lot would go to waste), so I grabbed the single Granny Smith apple in my fruit bowl and made a mini version. 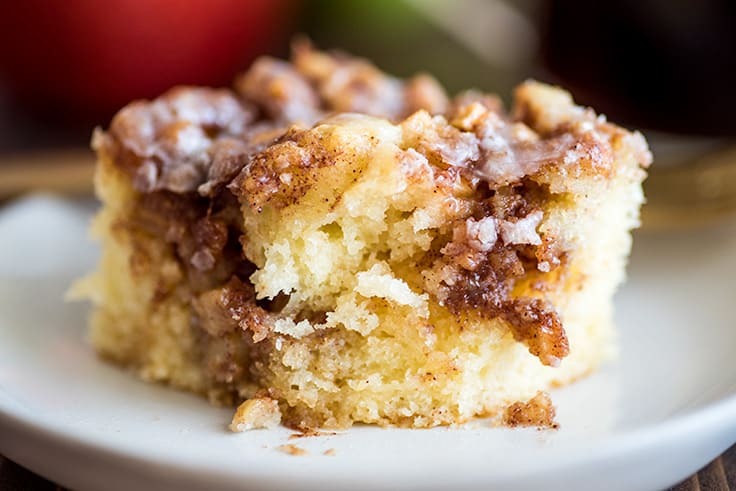 This cute little apple cinnamon cake is made in a 7×5-inch pan and is an upgraded version of my (already pretty perfect) Mini Coffee Cake. 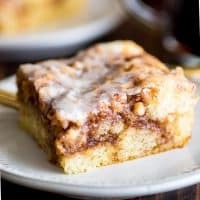 The cake is spongy and moist, with big swirls of apple and cinnamon and a sweet powdered sugar glaze that sets and crinkles when you cut into it. 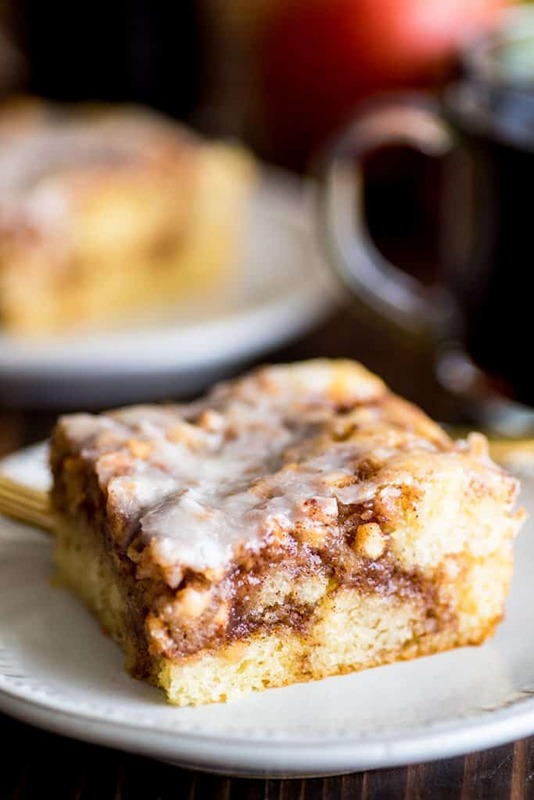 It’s absolutely glorious and perfect for fall mornings when you’re craving something sweet and want your house to smell like apple-cinnamon magic. This cake is not difficult, but it does have a few more steps than usual, so I’ll break them down for you just a bit. For the filling, you’ll mix up some cinnamon apples and what basically looks like a paste of cinnamon, sugar, butter, and a little flour. Set those aside and mix together a quick and simple coffee cake batter. 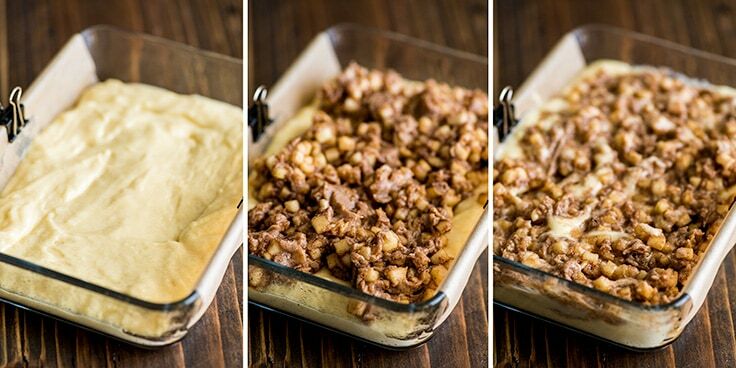 Once the batter is ready and smoothed out into a 7×5-inch baking dish, the apples and butter mixture get mixed together and then swirled into the cake batter. As you can see in the photos, the cinnamon filling to batter ratio is quite high, so you’ll want to really swirl that mixture in. You DON’T want to stir it and completely mix the two together, but don’t be afraid to cut deeply with those swirls so you see cake batter showing on top. Also, pro tip, if hanging parchment paper is making you nuts, clip it down with small binder clips to keep it tidy. I usually take them off before baking, but many people just leave them on. Then the cake goes into the oven for a little over half an hour. Once it comes out, it’s time to make the glaze. The glaze is just powdered sugar, milk, and vanilla extract. In the recipe, I recommend sifting the powdered sugar, but if you don’t mind having a few lumps in your glaze, you can skip the extra step. Pour the glaze over the warm cake and give it 15 to 20 minutes to set. If you glaze the cake right out of the oven, it will still be warm and a little gooey by the time the glaze has set, and this cake served warm and gooey is just a marvelous thing, so enjoy! Because this is a very sweet cake, if you’re eating it for breakfast, I recommend pairing it with a salty side of bacon or sausage and a cup of strong coffee. Or make it in the afternoon, grab a couple of friends, a couple of forks, and a pot of tea, and go to town. I recommend Granny Smith apples in the recipe because their tartness offsets the sweetness of the cake and glaze, but your favorite baking apple should work just fine. Because of the filling, this cake is a little tricky to test for doneness. If the top of the cake is still wobbling when you open your oven, don’t even try. Once it has set, find a couple different spaces toward the center where cake is showing through and test until you find a spot that is mostly cake and not filling. The cake is done when a toothpick or cake tester comes out with just a few moist crumbs. Try not to leave any large pockets of filling when swirling it into the cake, because the pockets will sink as the cake cools. For more small-batch breakfasts, you might also like these Banana Pancakes for Two, Small-batch Cinnamon Rolls, and Crepes for Two. Preheat your oven to 350°F and lightly grease a 7x5-inch baking dish. If you’d like to be able to lift the cake out of the dish, line with a sheet of parchment paper. In a small bowl, stir together apples, sugar, lemon juice and cinnamon. Set aside. In a small bowl, combine softened butter, brown sugar, flour, and cinnamon. Use a fork to mix ingredients until the mixture resembles a thick paste. Set aside. Add half of the flour mixture and mix until just combined. Repeat with remaining tablespoon of milk and second half of the flour mixture. Transfer batter to your prepared baking dish, smoothing out the top. Combine apple and butter and sugar mixture and stir together. Drop spoonfuls of the mixture over the top of your cake until it is all gone. Use a knife to swirl mixture into the batter. Cut deeply into the batter when swirling. You don’t want to completely mix the apples into the batter, but you should see some batter at the top. Bake for 27 to 35 minutes, until a toothpick inserted into a cakey section near the center comes out with just a few moist crumbs. While your cake is still warm, in a small bowl, combine all glaze ingredients. Whisk until smooth and pour over the cake. Allow the glaze to set for 15 to 20 minutes. This cake is best on the first day. Stored covered, it will remain very moist, but the glaze will become sticky and no longer set.